The Four Corners Millennium Project (FCMP) is set to transform Newark’s downtown commercial district into a residential and retail center, breathing new life into a part of the city once considered to be the epicenter of commerce in North Jersey. Construction for the five-block, multi-use redevelopment project will create more than 200 new construction jobs, according to Tim Lizura, president and chief operating officer of the New Jersey Economic Development Authority (NJEDA). “The Four Corner Millennium Project will add to the significant construction activity already underway in the City of Newark, “ he said. The redevelopment of the area is being divided into project phases. Work on the first phase, which is expected to begin this summer, will include construction of a hotel and parking spaces. Residential and retail space will be built on the site of the once popular Paramount Theater. The FCMP is near Newark Penn Station, Gateway Center, City Hall and the Prudential Center, as well as the internationally renowned NJPAC. More than 675 apartments will be built out of vacant and dilapidated office and warehouse space. An additional 220 residential units will be constructed over street-level storefronts. Planners hope the project will create a go-to area at Market and Broad streets where people will be able to live, work and play. In all, the project aims to transform five street blocks and includes 12 retail storefronts ranging in height from two to 16 stories. 603 structured and below grade parking spaces. Construction might have gotten started sooner, but RBH Group, owner of the project, was initially turned down when it first applied to the NJEDA for tax credits under the Urban Transit Hub Tax Credit Program (UTHTCP). The state agency denied RBH Group’s application last year, confirmed Lizura, because the company wasn’t able to provide commitments for the bulk of the $410 million in capital needed for build-out. However, with those commitments in hand, RBH Group reapplied and was informed in January that the project received one of the very last grants awarded under the UTHTCP. That program is now part of the larger umbrella economic initiative known as the Economic Opportunity Act. The NJEDA oversees the state’s economic initiatives aimed at incentivizing companies to stay in New Jersey or move here to create jobs and boost the economy. The FCMP will receive $33 million in tax credits and $19.5 million in funding from the Economic Redevelopment and Growth Program (ERG). Chris Colabella is the president of Construction Information Systems, the only local project lead service serving construction companies in New Jersey. For more information about CISLeads.com or to request a free demonstration of our service, call 800-247-1727. This entry was posted in construction, New Jersey, Newark, NJ, Uncategorized on March 22, 2014 by Chris Colabella. The Port Authority of New York and New Jersey (PANYNJ) announced last December the approval of a $1.2 billion program to pay for upgrades to the roads around Port Newark-Elizabeth. The announcement was welcome news for New Jersey heavy highway construction contractors, many of whom will be tapped to reconstruct several major roads in the region. In a statement announcing the move, Bill Baroni, deputy director of the PANYNJ, said the capital will fund efforts to modernize infrastructure. The appropriation “will ensure that we bring the era of 1950s roads into modern times so they can handle the volumes of cargo and resulting trucks that we deal with today,” he said. This program is part of a continuing PANYNJ initiative to make Port Newark-Elizabeth more efficient and environmentally friendly by reducing truck congestion on the port’s aging roads, according to the PANYNJ media relations department. Planners expect that the road improvement project will mean less truck congestion in the region near the port. Further, as an added benefit, the decrease in truck traffic will add up to a whopping reduction in harmful truck emissions — about 281 pounds per year! A Port Authority representative said improvements, design and reconstruction of five major access roads around New Jersey’s shipping terminals at Port, Corbin, Marlin and Kellogg streets and Doremus Avenue are expected to save $60 million in operating costs in the next 30 years. The PANJNY was expected to award the contract for engineering services for the Port Newark-Port Street Corridor Improvement Project in late January (after the submission deadline for this article.) The Authority will coordinate and monitor overall design, including environmental design, landscaping design, geotechnical engineering services and civil engineering design. Additional projects are expected to go out to bid in the coming months. In addition to repaving the five roads near the port, the project also calls for upgrading barriers, improving drainage, replacing traffic signals and signs, as well as realigning portions of the roads. This also includes demolishing and replacing the Corbin Street ramp. The PANJNY media representative said the construction should provide $1.2 million in safety benefits in the same time period. In the past several years, these roads have been the site of numerous traffic accidents. When the widening of the Panama Canal is completed in 2015, the PANJNY expects that the size of container ships needing to access Port Elizabeth will increase significantly. The current height of the Bayonne Bridge is a problem because officials believe it won’t be able to accommodate the larger vessels. Therefore, one other major infrastructure improvement is included in the $105 million strategy; the PANJNY intends to raise the Bayonne Bridge by sixty-four feet by the time the Panama Canal project is completed. Baroni has said that making sure cargo is able to flow safely and efficiently through the port is critical to New Jersey’s ability to attract international shippers to do business in the region. Chris Colabella is the president of CIS, Inc., New Jersey’s only local construction lead service. For more information, visit http://www.cisleads.comor call 800-247-1727to arrange for a free demo of CIS Leads. This entry was posted in bayonne, bridge, construction, New Jersey, NJ, Port of Elizabeth on February 9, 2014 by Chris Colabella. The Meadowlands region is gearing up to show off its Big Game Sunday Best in February 2014, when Super bowl XLVIII comes to the MetLife Stadium. Plenty of businesses are counting on seeing green in the form of untold revenue dollars, thanks to football fans. However, many people look at the nearby sports and entertainment complex, once called Xanadu, and all they can see are the now-infamous walls of blue and white, red and orange. In late October, Triple Five, developer of the project since 2011, received the go-ahead to restart construction on the long-stalled American Dream Meadowlands project. The Borough of East Rutherford authorized a half a billion dollars in bonds to get the project going and the State of New Jersey offered Triple Five a huge tax break, as well. About 35,000 permanent jobs will be created once the complex is open to the public. Skanska USA of Parsippany will lead construction of the indoor amusement park while the Whiting-Turner Contracting Co. of Bridgewater will complete the rest of the project. New Jersey’s American Dream has been a long time coming. February 2003: Mills Corp. is selected by the Sports and Exposition Authority as the developer of Xanadu – a sports and entertainment complex. November 2006: Much of the original first phase of the project is framed out, including what will be the first indoor snow hill for skiing in North America. April 2007: Mills Corp. goes bankrupt; Colony Capital takes over the project as developer. March 2009: With much of the first phase still to be constructed, lenders bail out and work is shut down. To date, about $2 billion had been spent on the project. February 2010: Giants Stadium was torn down. May 2010: A month after learning that the 2014 Super Bowl was coming to the Meadowlands, the MetLife Stadium, constructed adjacent to the old Giants Stadium property, opened its doors. The stadium, part of Phase 1, was built by two NFL teams, the Giants and Jets, with private funds – which is why its construction, at a cost of about $1.6 billion, was not affected by the financial issues that plagued the first two developers. August 2010: Colony Capital is removed from the project by lenders. 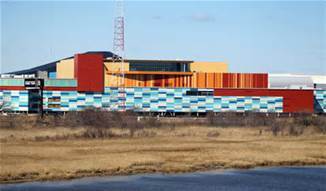 May 2011: Triple Five takes over as the new developer and announces it will rename the project American Dream Meadowlands. An indoor water and amusement park complex are added to existing first phase plans. On Oct. 15, 2013, the Borough of East Rutherford authorized $524 million in bonds so that Triple Five could finally get the job done. Two weeks later, final approvals – and a huge tax break for Triple Five to the tune of $390 million — came down from the state. It is rather fitting that the project is called the “American Dream.” When the job was originally named, few regarded the swampy land around the Meadowlands’ Continental Arena as a “Xanadu.” However, the visions of grandeur outlined by architects and developers caught everyone’s eye. A Bourbon Street-inspired nightlife scene. When Triple Five took over as developer in 2011, it added a glass-and-steel-domed, climate-controlled amusement park with a water park and the world’s largest wave-generating pool to Phase 1. Phase 2, calls for the development of an additional 4.5 million additional square feet which will include hotels, a convention center and a sports center. With Super Bowl Sunday only months away on Feb. 2, 2104, Triple Five, the developer that also owns the Mall of America in Minnesota, says it’s game time for the long-awaited project. While the sports complex won’t get the new pre-Super Bowl paint job Gov. Chris Christie asked for early on in the Triple Five takeover, after close to 11 years, it looks like East Rutherford – and all of New Jersey – may finally be back on track to realize the American Dream. Chris Colabella is the president of CIS, Inc., New Jersey’s only local construction lead service. For more information, visit http://www.cisleads.com or call 800-247-1727 to arrange for a free demo of CIS Leads. This entry was posted in construction, Meadowlands, New Jersey, Newark, NJ and tagged american dream, Met Life, xanadu on December 20, 2013 by Chris Colabella. When Gov. Chris Christie signs the New Jersey Economic Opportunity Act of 2013, the state’s five current economic business incentive programs will be condensed into two – phasing out the popular BRRAG (Business Retention and Relocation Assistance Grant), BEIP (Business Employment Incentive Program), and Urban Transit Hub Tax Credit Program. At press time, the initiative (Assembly No. 3680) is awaiting the governor’s signature (he has long said he will sign it), after being introduced in May by Assemblyman Albert Coutinho (D-Essex), chairman of the state’s Economic and Commerce Development Committee, and passed by both the Assembly and Legislature by the end of June. The Act designates Grow New Jersey Assistance Program as the state’s business retention and attraction program, while ERG (Economic Redevelopment and Growth Grant) would be New Jersey’s redevelopment incentive program. Efforts to streamline business development in the state are led by the New Jersey Economic Development Authority and aim, first and foremost, to retain and create jobs here. Under the Act, the newly defined programs encourage redevelopment of urban centers, suburban office parks and areas impacted by Hurricane Sandy. Regardless of what they are called, business incentive programs (read: grants and tax credits), which compel companies to expand or relocate here, translate to more work for New Jersey’s construction industry. These projects call for new buildings and site expansions, as well as new roads and other infrastructure projects. In Assemblyman Coutinho’s own backyard of Essex County, the $444 million Prudential Office Towers project, located at Broad and Halsey streets in Newark, is being financed with the help of a $211 million tax credit from the Urban Transit Hub program. Prudential Financial said SJP Properties of Hoboken will begin construction on its new 20-story office tower and 55-foot-tall parking garage by the end of this summer. Business incentive programs have been a lynchpin in the state’s economic development plan – a go-to tool in the toolbox, if you will, when a business announces its plan to leave the state. When it works, it’s a win-win for the company and the state. In fact, Gov. Christie was on hand to help cut the ribbon at the official opening of Realogy Holdings Corp.’s new Madison Township headquarters on June 20. Back in early 2012, the company had announced its decision to pack up and move from Parsippany to North Carolina. However, Gov. Christie and his economic development team stepped in to offer Realogy a $10.7 million BRRAG award, plus a $1.4 million sales tax exemption. The move convinced Realogy to stay in New Jersey and build its new global headquarters in Madison. A year later, the residential real estate franchise giant broke ground on its new 270,000-square-foot complex. Newark-based Tishman Construction Corporation of NJ headed up construction of the three-story office complex with parking garage. For now, existing tax and other business incentives associated with BRRAG, BEIP, etc. remain available to qualified companies. (Visit http://www.njeda.com for more information.) However, even when these programs are merged under different titles – namely Grow New Jersey and ERGG — construction companies should reap the benefits of state programs that provide businesses with capital – either in the form of grants or tax credits. — at least that’s what the State of New Jersey is counting on. Chris Colabella is the president of CIS, Inc., New Jersey’s only local construction lead service. For more information, visit http://www.cisleads.com or call 800- to arrange for a free demo of CIS Leads. This entry was posted in construction, government, New Jersey, NJ, Uncategorized and tagged christie, development, economic, economy, NJ incentives on October 16, 2013 by Chris Colabella.